On paper Kawasaki’s ZX-7R never had much going for it. Launched in the same week as Suzuki’s GSX-R750WT, the Kawasaki was almost 20bhp down on the Suzuki, while carrying an additional 24kg. The ZX-7R was clearly related to the outgoing ZXR750L where the new GSX-R was a brand new bike from the ground up and where the Kawasaki made much of its superbike racing DNA, the Suzuki had a chassis, supposedly based on Kevin Schwantz’s GP bike. But the Kawasaki had one trump card. It looked stunning, especially in the launch colours of red or green with a purple seat unit. The Kawa had the headlights, the aggression, the attitude and most definitely the colours. Suzuki’s blue and white was strong, but the gold and brown cheese-grater version (grated tiger anyone?) was a little too, er, brown for most people. Under the skin the ZX-7R was a lot newer than it looked. The engine now had a slightly bigger bore and shorter stroke so it could rev faster and higher. That new bore size (bigger than the 918cc FireBlade of the time) also gave it good bottom end power and midrange too. Shorter inlet tracts increased the velocity of air and fuel heading into the cylinders and the additional ram-air inlet now meant enough of said air was getting into the motor at speed to keep a small aeroplane in flight. On the dyno, the engine was a little disappointing, making around 108bhp, but an unofficial speed test involving a mate of mine, a loose-fitting anorak and a French B-road showed it was 5mph faster than the outgoing ZXR and when we finally got it to the test track, that turned into 10mph quicker at 167mph. The frame was stiffer and used the engine as a stressed member, but geometry remained roughly the same as the ZXR, although wheelbase increased by 5mm. In theory this meant that the notoriously stiff ZXR would be even stiffer and slower turning as the ZX-7R, but Kawasaki got the suspension linkage ratios right, the settings right and managed to retain both the legendary accuracy and sharpness of the front end while adding a little more ride quality to the back end. More than that, despite being well down on power on paper, Kawasaki understood that few of us actually ride on paper, and on tarmac, the ZX-7R had so much more midrange that it’s tendency to bugger off into the distance (or should that be dustance?) and leave the new GSX-R waiting for a powerband that rarely arrived soon enough was either embarrassing or satisfying depending on whether you’d bought blue or green. On the track it was different – the Suzuki wiped the floor with it, but on the road, the ZX-7R was the better bike, no question. It was faster, more stable and easier to corner for us ordinary riders than the GSX-R, or the FireBlade. Add that to the drop-dead styling and the news that the first batch of 1996 GSX-Rs were lunching their engines and Kawasaki must have been smiling. Even by the end, in 2004, when the ZX-7R finally dropped out of the range, Kawasaki were still selling more than the bike had any right to. By then it was way too heavy, underpowered and clumsy next to a generation of fuel-injected, mass-centralised missiles. But the ZX-7R still had a following, mostly down to the exploits of Mr Walker and Yanagawa-san in WSB who made every race look like their lives depended on it. Riding a ZX-7R race bike was a lot harder work than the big Ducatis and Honda SP-twins, but they stuck in there, digging out results, inspiring us to go buy one. And truth was, that with a decent discount, the ZX-7R was still a good road bike. In 2018 a ZX-7R represents the second best of mid-90s sports biking. A good FireBlade will be better in every respect, but it will also be at least £500 more expensive, cost more to insure and not even rose-tinted glasses can hide the fact that the paint schemes were awful. Welcome to the world of cheap 1990s sports bikes. Fixing it costs time and a bit of money. Servicing is reasonably simple, once you get the tank off and spares are plentiful – new and used. Look out for crash damage and signs of being an ex-track bike. Not many were raced outside of proper superbike classes, but plenty have been cheap track hacks so check carefully for signs of bent bits and scrapes, no matter what the owner says and never, ever buy a ZX-7R unseen from a private ebay seller. Thankfully a ZX-7R crashes well, usually destroying more of what it hits than the bike itself, but there are plenty of big green ‘Kawsualties’ out there so take your time. Prices have bottomed out at around £1500, but it’s worth finding a really good one on offer at £2500 and bidding it down to £2000 because no one else will ring at that asking price. Dealers can get cheeky asking much more, hoping to snare an impulsive nostalgic with a good finance deal. And right now, in March, everyone adds an extra £500 too. Hold your nerve – there are plenty of good bikes out there at the right price and you might want a ZX-7R but what you really want is a good one for the right price at some point, not a lash-up bought quickly because you have to have one…NOW. Other things to check are whether it was a parallel import or not. Many bikes sold from 1998-2001 were Euro-spec machines with Km/h clocks and headlights pointing right. Many have been swapped, but not all. Also be aware that, along with many ram-air assisted bikes a ZX-7R will suffer chronic carb-icing (rough-running at low revs and stalling) in cold, damp weather. UK bikes came with carb-heater kits that made some difference but never properly fixed it. Euro or USA spec bikes might not have them fitted. 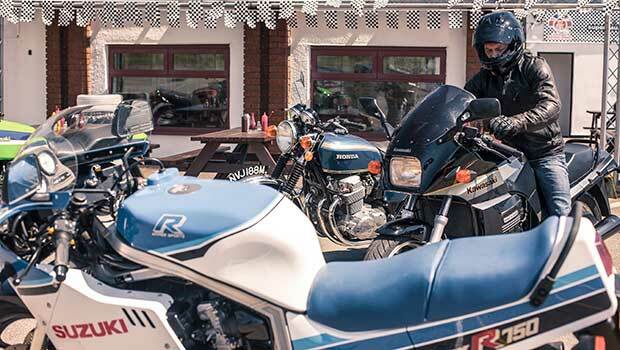 Expect to spend a little time reviving the brakes and suspension and then a little more learning to manhandle what is probably the butchest motorcycle you can buy around your favourite back roads. Once you’re confident, enjoy the fun of filling the ears of modern bike owners with the angry growl of a proper Kawasaki up their pipe. Childish? Yes, of course. We can always grow up tomorrow.